This is the newest recording project by Juba Nurmenniemi of Pseudo Sun. He plays all the instruments except the drums on this project and decided to come up with another name instead of Pseudo Sun, as that is a real band project. This music is much more like the cassette tape release by Pseudo Sun. 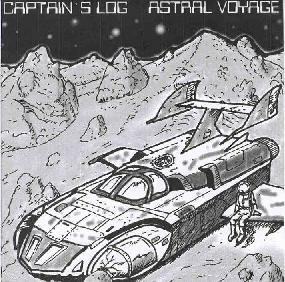 This tape consists of 7 tracks (total of 60 minutes) of long space voyages into the unknown. The synths are very rich and spaced out while the bass lines very prominent. There is more guitar soloing on this release than the other cassette release by Juba as well. Some of the numbers are mostly spaced out synth and bass excursions while others like At the Galactic Center and This Galaxy Ain't Big Enough for the Both of Us, have a real guitar riff. The later, reminding me a bit of the sound of Bedoiun and the guitar riff from Reefer Madness by Hawkwind. I really enjoyed the CD-r a lot and highly recommend it for late night journeys into space and beyond. Contact c/o Juba Nurmenniemi, Bishop Jöns v. 53, S-176 76 Järfälla, Sweden.